Aperture is one of the three pillars in photography exposure. The other two being shutter speed and ISO. In super simple terms, an aperture is a hole within a lens. The aperture hole opens to allow light to pass through the lens and hit the camera sensor. Apertures are expressed in f numbers (f8, f1.4, f16 are a few examples). (Videographers uses T numbers). The larger the number, the smaller the hole. The smaller the number, the bigger the hole. Sounds confusing, we know, but you'll get used to it. You'll find that the lenses with the biggest holes (smallest numbers) will be the most expensive and physically largest. That is because these lenses aperture opens the widest, which lets in the most available light. The aperture is a very widely talked about part of photography as the aperture gives depth and dimensionality to photos. Aperture can create beautiful blurry backgrounds or bring a whole scene into sharp focus. We mentioned above about depth of field. This is an inherent property of the lens, whereby the wider the aperture, (smaller f number), the less of the photo will be in focus. Having a blurry background can really draw the viewers attention to the subject of the photo, and isolate the foreground from the background. We call this a shallow depth of field. 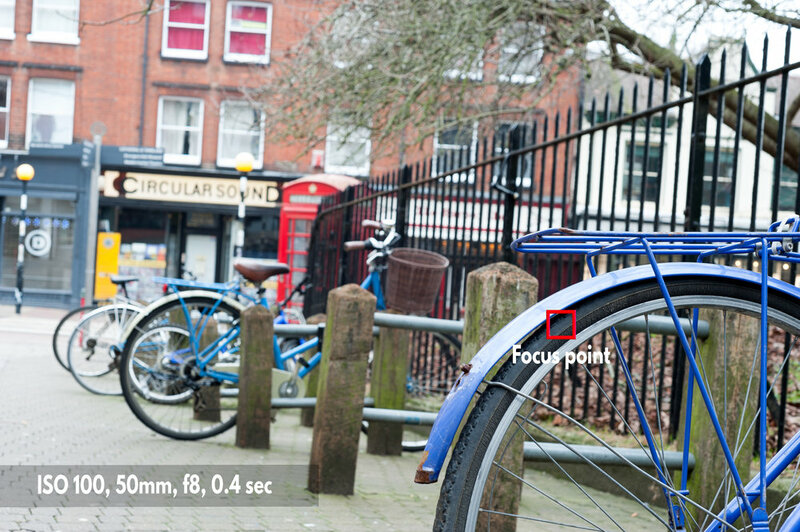 Using small apertures (bigger numbers, f22 for example) will give us a deeper depth of field. For situations where you need the whole photo in focus, you'll need to use small apertures. The smaller apertures are perfect for landscape photography where you want the whole photo to be in focus. Below are a couple of example photo sets. One being a street photography scene with a 50mm fast lens. The other showing how aperture affects a scene through a wide angle lens. Each lens has a maximum and minimum aperture size. These will vary in sizes and the maximum is usually displayed on the side of the lens. The smallest aperture isn't really displayed as it is of less importance as most lenses can stop down to at least f16. Zoom lens - With a constant maximum aperture, there will be one f number displayed. If the lens is a zoom lens with a variable aperture, there will be two. The variable aperture means that the lens has two different maximum apertures. When fully zoomed out, it'll be one, when zoomed in it'll change to the other. A Nikon 70 - 300mm f4 - f5.6 for example, has a maximum wide aperture of f4 at 70mm. Zoomed in to 300mm, the maximum aperture changes to f5.6. Constant maximum apertures on zoom lenses will tend to be f2.8 apertures. The lens will have a maxium aperture of f2.8 through all focal lengths. Most of the pro versions of zoom lenses will have a maximum constant aperture of f2.8 , cost a fair amount more, and have huge glass elements. All of the extra glass adds lots of weight, so these lenses are heavy! Lenses that have a maximum aperture of f2.8 or wider (smaller f number) are considered fast lenses. Fast lenses allow lots of light through their wide apertures and are brilliant for low light photography. The wider the aperture, the better the ability to isolate subjects and blur the background. Having the ability to change the aperture yourself will maximise your creative control. The easiest way to change your aperture is to use the aperture priority mode. (A on Nikon and Av Canon). Essentially, set an aperture and shoot. The shutter speed and ISO (if auto-ISO is selected) will automatically adjust to suit the chosen aperture, and create an exposure based on the metering. It'll be worth learning how to use exposure compensation when shooting in aperture priority mode too. Manual mode is the other way to change the aperture. Knowledge of how to make an exposure is essential to creating photos using manual mode. Our exposure triangle is a brilliant reference point and can be found here.